Often when out for a wander around little side streets of London I chance upon a nice looking church, but one with the doors resolutely locked. Oh well, I think and wander along. Half a year or so later I might be in the same area and wondering if that nice church I saw somewhere in the area is open, which often results in half an hour of wandering around trying to find it again, only to be presented with the same bolted closed doors. After several years of this, the last time I wandered past one particular church I checked the opening hours then made a mental note that it would be open on a Friday lunchtime, which is convenient for me to revisit it properly. A mental note of a day/time means I am more likely to make the effort for a special trip. The building which has tantalized me for so many years is the rather grand exterior of St Stephen’s Church in Westminster. 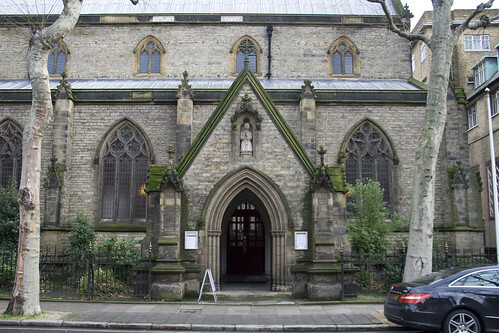 Although just a couple of minutes walk from the activity of Victoria Street and around the corner from Channel4’s head office, it is a church you would not casually pass unless you had certain reason to use the street it fronts onto. Which is a historic curiosity, for Rochester Row was once the main road in the area long before Victoria Street usurped it with its edifices of modern offices and shops. The “row” was originally laid out back in 1677 as the first major street across the fields, and even a hundred years later, it was the only main road across the fields. It was not until 1850 that the church was opened though, and the entire building was paid for by the fabulously wealthy philanthropist Miss Burdett Coutts (of banking fame) in memory to her father, the late Sir Francis Burdett. 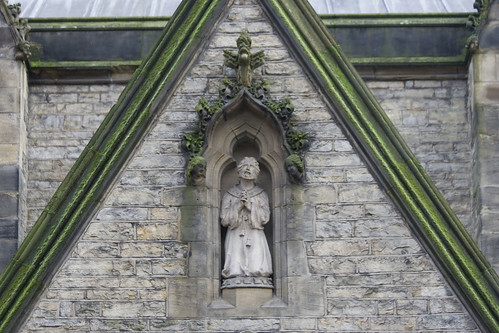 Designed by Benjamin Ferrey, a pupil and biographer of the more famous Pugin, the exterior of the church is based on the 14th century style, and built from a mixture of ragstone and sandstone. 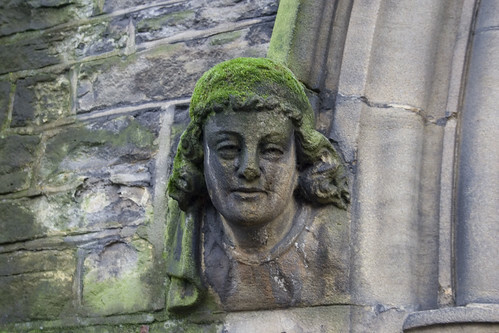 Moss covers much of the old stone work having somehow survived Victorian pollution and giving the church an air of being much older than its 160 years. A rather nice porch leads into the church, with a heavy wooden door concealing a rather more utilitarian modern internal porch. Do note the six grotesques that line the porch and sit on either side of the doors. Despite the gothic inspired exterior, the inside looks almost austere by comparison. If this were truly a 14th century church I would suspect the destructive effects of the 17th century puritans, but this was built more recently, and I presume adopted that effect deliberately. As such, while a nice interior, it isn’t one that rewards a long lingering visit as frankly there just isn’t a lot to look at. 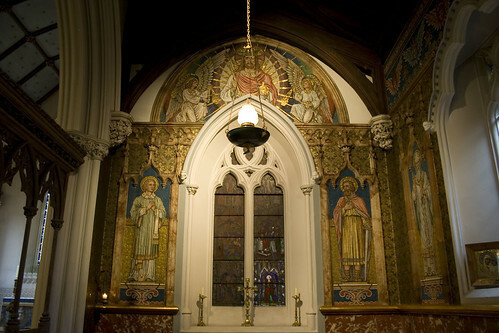 What is worth looking at though is the small chapel next to the main chancel, which is frankly stunning, and exactly the sort of overblown thing I would expect from a pupil of Pugin, but is actually dated to some 50 years after the church was consecrated. 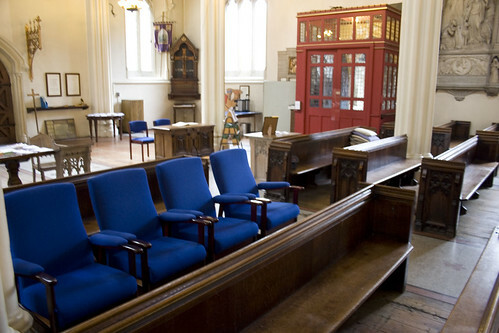 Lined with conventional wooden pews, there is one row of rather more comfortable chairs. The caretaker who was looking after the place when I visited admitted that he had no idea why there were there – probably for elderly parishioners we agreed. Outside the most significant aspect of the church is the spire, which once dominated the area but is now surrounded by tall office blocks. Indeed, so dominant was it that it could be seen from the Baroness’s drawing room in Piccadilly, but was cut down in 1968 due to war time damage making it unsafe. The current 1994 installed spire is a lightweight replica, but they have retained the detailing of the original. The railings around the church are also modern replacements of the ones removed during the war, themselves being salvaged from a nearby property redevelopment. 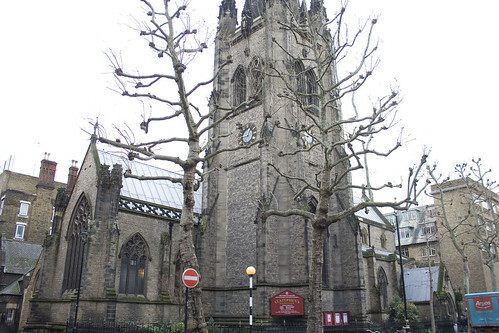 The church is open most lunchtimes until 2pm, and they hold occasional coffee concerts at lunchtime (map link). 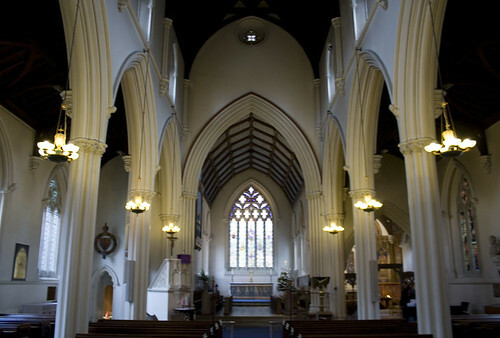 When the church was consecrated, it received a full write up in the Illustrated London News, who claimed that up to 900 people could fit inside for a service. I can only presume that Victorians were even smaller than I expected as I would struggle to see half that number fitting inside! An excellent article, many thanks for raising awareness of the church and the role of Burdett-Coutts in doing so much for the area. The church was built on the edge of the Devil’s Acre and reading about the efforts by local vicars to bring morality to that part of London makes for interesting reading. The memorials are also worth looking at from a local history perspective, mostly from the great and good who sacrificed considerable comfort and wealth to helping others. You probably also know that the school next door, named after the benefactor was built at around the same time and joins with Kingway College in being a clear example of philanthropic work in ensuring an education for the children of the area into adulthood. The small war memorial at the rear of the church is rather interesting too, as it depicts a dusk image of London I believe from the Second World War, but I may be wrong. 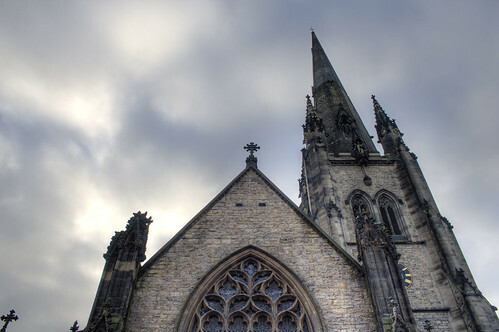 Thank you Ian for this most wonderful article on St Stephens Church. Pugin is my favourite architect and having worked near Rochester Row for over 35 years I must now hasten to reeducate myself, particularly about the life of Baroness Burdett-Coutts! When I visited this church, I found the painted white/cream/magnolia interior (including pulpit) rather odd. I’ve not been able to ascertain when and why it was painted, though I know it was not originally like this. Angela Burdett-Coutts is a largely forgotten, fascinating and somewhat problematic woman. she deserves more attention.